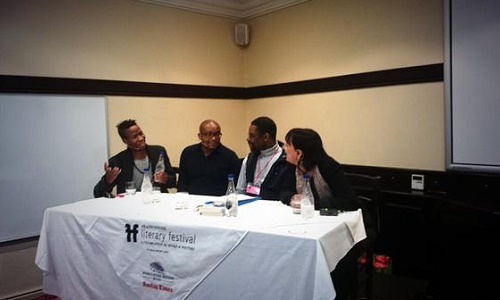 Discussing “How do African writers make their mark on the international market?” (Our considered conclusion: who the hell knows? We just write books.) With Harry Garuba and authors Ekow Duker and Masande Ntshanga. Talking about African literary prizes with Sunday Times books editor Ben Williams and authors Diane Awerbuck and Helon Habila. Conclusion: they should give us more of them. 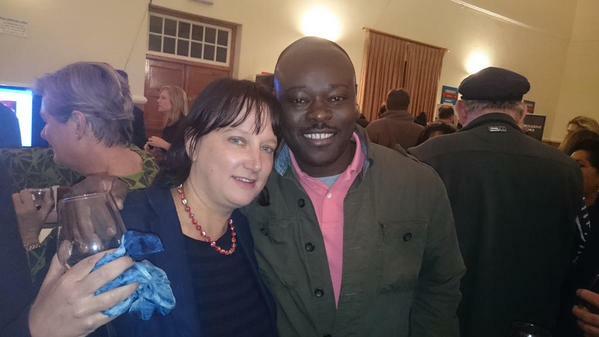 With author Helon Habila at the author’s welcome party. With author and artist Nathan Trantraal at the author’s party. Next post:Franschhoek Literary Festival: done and dusted. That was fun.